Are you a Central Bucks County Chamber Member or friend of the Chamber? Then chances are you receive the W4 Magazine printed by the Chamber of Commerce. We are proud to announce we, DRS – Digital Reprographics Solutions, were featured in the Arts Issue of 2015. Here is a link to the Digital Version of the W4 Magazine. Below is a copy of the article and a partial photo of the page. The DRS (Digital Reprographics Solutions) business model is strategically unique among large format graphic reproduction companies in the country. The business model was not an accident, rather carefully planned and made possible by the complimentary pairing of 2 business professionals, owner Mark Mercure and VP Mike Stafford. As a result of this dynamic pairing, DRS is one of the only print reproduction companies that offers a range of wide format print reproduction capabilities in one location. Most competitors have to either limit what they can handle or they have to sub-contract the business elsewhere. So what really makes DRS special? For starters, location. Second the experience. The principles at DRS come from backgrounds that include IT, technology, engineering, construction and business experience. 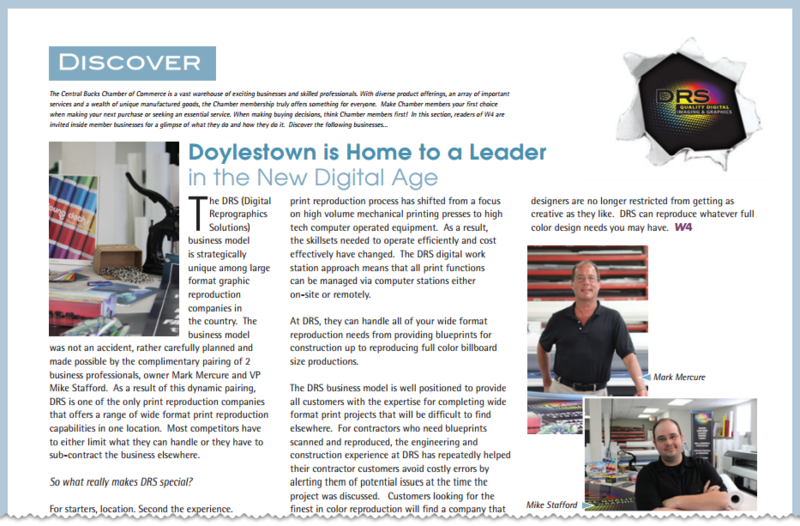 When Mark and Mike started the business, rather than follow a traditional model for the print reproduction business, they combined their skills and experiences to develop a new business model. The result is a very efficient and effective operation that works exceptionally well for clients and the environment. DRS carefully selected state of the art graphic reproduction equipment to insure that their ability to reproduce images for customers is unparalleled. Next they invested in training for their operators to insure that they understood how to fully use and exploit the capabilities of their new equipment. The print reproduction process has shifted from a focus on high volume mechanical printing presses to high tech computer operated equipment. As a result, the skillsets needed to operate efficiently and cost effectively have changed. The DRS digital work station approach means that all print functions can be managed via computer stations either on-site or remotely. At DRS, they can handle all of your wide format reproduction needs from providing blueprints for construction up to reproducing full color billboard size productions. The DRS business model is well positioned to provide all customers with the expertise for completing wide format print projects that will be difficult to find elsewhere. For contractors who need blueprints scanned and reproduced, the engineering and construction experience at DRS has repeatedly helped their contractor customers avoid costly errors by alerting them of potential issues at the time the project was discussed. Customers looking for the finest in color reproduction will find a company that understands color and has both the equipment and the expertise to reproduce true color for their projects.